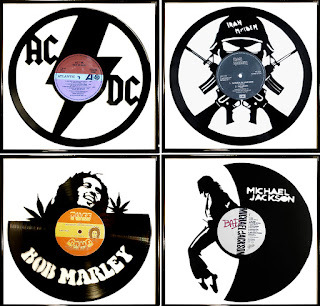 Handmade out of old Vinyl Records, Beautifully framed to hang on your wall. Bespoke Commissions are also available on all Vinyl. Art work can take one week do be delivered. * Commissioned works are priced as above. * For work not available in our Single Artist/ Band Catalogue, there is an extra charge of £10 Per new Image set-up. Order online and pick up later in one of the local markets. If you would like to host an Art On Vinyl Exhibition in your Coffee Shop, Restaurant, Pub, Gallery or Music Venue, please contact me using the details below. I would like to hear from you.